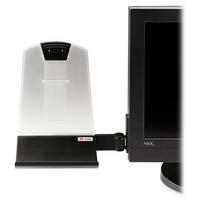 Document holder is designed specifically for use with flat panelLCD monitors but also works with CRT monitors. Mount to left or right side. Patented clip accommodates up to 35 sheets in portraitlandscape letter size and legal size paper documents. Document holder includes Command Adhesive to mount to monitor, allowing clean and easy removal with no residue.